We explore the restaurants at London’s newest shopping destination. From the Shard and Battersea Power Station to the BBC Television Centre, the trend for combined residential, restaurant and retail developments continues apace in the capital. Situated next to the established Granary Square and part of the ongoing regeneration of the King’s Cross area, retail hotspot Coal Drops Yard is the latest multi-use development to feature restaurants, bars and cafés alongside high-end stores, with plenty of pedestrianised public spaces for markets, street festivals and cultural events. Heatherwick Studio was responsible for the architectural transformation of Coal Drops Yard; taking two 1850s coal sheds, which formerly housed the once-indispensable source of fuel until it was ready to be delivered across Victorian London, and joining them together with a majestic curving roof. This is the fourth and largest Barrafina in the group owned by brothers Sam and Eddie Hart – and anyone familiar with their other restaurants will immediately recognise the signature counter with its red leather stools – here, set underneath exposed wooden beams. Start with a sherry and a few Para Picar, then pick one of the interesting vegetable dishes and something from the grill – if you are a lover of sweetbreads then those cooked in the Josper oven are a must-have. They offer their famous pan con tomate but what marks this restaurant apart from the other three in the chain is a menu inspired by the cuisine of Catalonia, a particular feature of which is dishes that blend meat and fish (Mar Y Montana or ‘the bounty of the sea and mountains’). The staff instinctively know what works well and how much you should order so asking for advice is positively encouraged. They don’t take reservations but there’s plenty of space in which to wait for a seat. Alternatively, come with a group of friends and make use of their private room overlooking Regent’s Canal. Opening their own restaurant had been a long-held ambition for old friends Pip Lacey, ex-head chef of Murano, and her business partner Gordon McIntyre, and they considered many locations before deciding Coal Drops Yard was the perfect fit. The name, pronounced ee-chay, is Latin for ‘current’ and ‘of the moment’. It’s incorporated into the Wolf & Badger store – which resembles a NYC loft – and in the evening, when the music’s turned up, you feel like you’re a guest at a banging house party. Sip on a cocktail while you choose the dishes for your starter sharing board: something pickled, something cured; perhaps some rillettes and beer bread. Next, get stuck into some of their signature hot sticks – upmarket versions of kebabs, which come with an array of different tastes and textures and which, like many of their other dishes, are cooked over hot coals. There’s a relaxed and happy air at Hicce – something the bubbly service goes a long way towards creating – and which the planned summer terrace and outdoor barbeque can only add to. The Coal Office is a collaboration between Israeli chef Assaf Granit and renowned designer Tom Dixon, and is as super-stylish as you would expect, with striking pendant lights, a long narrow interior and an open kitchen which allows the chefs to create theatre and atmosphere through their interactions with diners. Having decided to relocate his global offices and showroom to Coal Drops Yard – and a keen admirer of what Granit had achieved at The Palomar and The Barbary – Dixon approached the chef and asked him to oversee the kitchen. The menu showcases his unique style of modern Israeli cuisine, with breads cooked to order in the wood-burning oven and eye-catching, delicately spiced Middle Eastern dishes. In the summer the dual aspect roof terrace will be a great place to linger awhile as the sun goes down. If you’re partial to a glass of Vermouth, a visit to Vermuteria is a must. Anthony Demetre’s all-day café and bar celebrates all things Vermouth and offers a short menu of dishes styled to match. 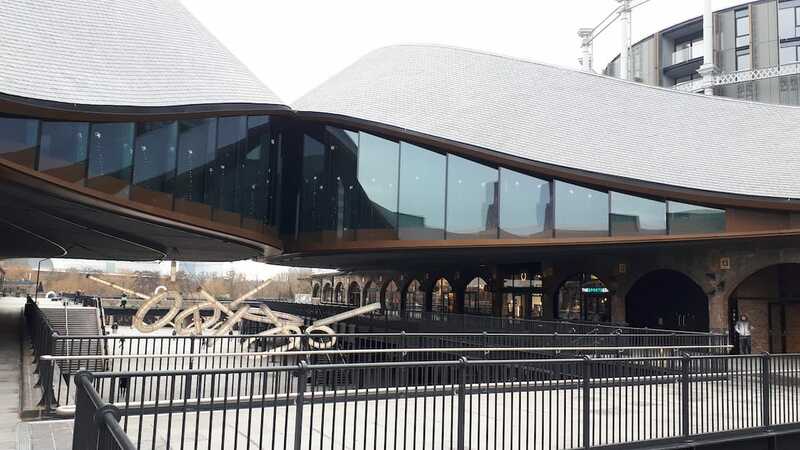 And coffee aficionados will be pleased to hear that not only has Alain Ducasse opened one of his prized chocolate shops at Coal Drops Yard, but also the first Le Café Alain Ducasse outside of the French capital. The roasted beans are delivered daily from Paris and the unique process they employ aims to deliver a consistent cup of coffee every time, no matter who makes it.